Splash Damage is giving Brink veterans some thank-you features, and greenhorns a reason to enlist. With all the attention Bethesda is enjoying from Skyrim, it seems someone over there decided it's perfect timing to divert some of the spotlight to one of its less successful titles: Brink. Brink was released back in May to sales and reviews that could be most fairly described as, well, fair. Still, the first-person, Parkour-based shooter has maintained a decent community of players since launch, and its developer, Splash Damage, is looking to reward it while hopefully bringing in some new blood at the same time. To accomplish this, its brand new clan and tournament system has just gone live in tandem with a free extended weekend of play on Steam. â€¢ Create your own Brink clan, allowing you to manage everything from your name and logo to recruitment status, and your members. â€¢ If running your own clan isn't your thing, join an existing squad that's currently recruiting. â€¢ Fight for position on Brink's Global Clan Ladder by challenging other clans and defeating them in exciting clan matches. â€¢ Enter your clan into tournaments with unique rule sets and map rotations. If you haven't taken the time to try the shooter yet, Splash Damage wants to earn your support by offering the entire game for free on Steam for four full days. The download went live today at 1:00 P.M. EST and will be available until 1:00 P.M. EST on Monday, December 5th. If you like it, you'll then have the option to purchase Brink for 75% off retail price. 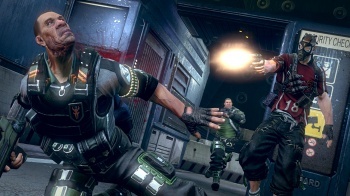 Brink may not have created the same retail lines as other 2011 shooters, but instead of whining about it, Splash Damage has chosen to roll out new features, offer free play, and give potential gamers a sweet, sweet discount. You may not have liked Brink if you're someone who played it, but if you haven't, and were ever even sort of interested in doing so, you've officially lost your excuse not to try it.